I found the answer I was looking for when I attended a session at the National Writing Project’s National Meeting in 2010. The presenter of this session was Alan Gershenfeld, the founder and President of E-Line Media. 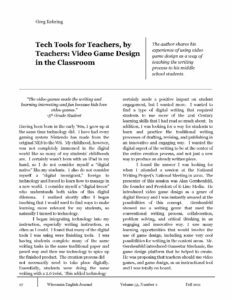 He introduced video game design as a genre of digital literacy and I was instantly amazed at the possibilities of this concept. Gershenfeld showed me a writing genre that used the conventional writing process, collaboration, problem solving, and critical thinking in an engaging and innovative way. I saw many learning opportunities that would involve the use of game design; including some very cool possibilities for writing in the content areas. Mr. Gershenfeld introduced Gamestar Mechanic, the game design platform that he helped to create. He was proposing that teachers should use video games, and game design, as an instructional tool and I was totally on board.